About a year ago, Jeremy and I started taking advantage of what I believe is called a "box scheme", whereby some very nice people deliver fresh fruit and vegetables right to your front door on a weekly basis (for a small fee, of course). 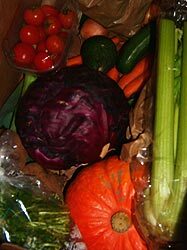 Since there’s no farmers’ market in Brighton, and the nice market in Lewes only comes around once a month, the box scheme seemed like the best way to get mostly local, mostly organic vegetables on a regular basis. We order from Real Food Direct, who will actually bring just about anything to your house if you want them to. We’ve gotten fantastic local lamb from them, and they also sell the best buffalo mozzarella we’ve come across. But mostly, we order their organic vegetable box, which changes from week to week, and which always includes at least one vegetable that I would generally not think of buying if I was in the supermarket (like fresh beets), as well as lots of carrots, which I would also generally not think of buying if I was in the supermarket (not that I don’t like carrots, but I mean, how many carrots can two people eat?). This makes the veg box something of a challenge, because we’re forced to find recipes for things that we’ve never cooked before, but that’s part of the fun of it. I don’t think I ever would have made - and realized I actually like - borscht if I hadn’t been faced with half a ton of beets and cabbage, and I also never realized how nice carrot cake could taste before being forced to make my own to use up the endless veg box supply. But besides the pleasure of having tons of fresh vegetables every week, I just love getting the veg box. The nice veg people bring it to our door, and then we haul the big box upstairs and put it on the kitchen table, and I have a field day rummaging through it to see what we’ve gotten (see, sometimes they have to substitute one vegetable for another, so you can never be totally sure what you’re going to get). It’s like getting a giant vegetable care package or Christmas present every week: "Oh, look at the watercress! Lovely… - Hey, we got a squash! - Mmm, I can’t wait to eat those tomatoes…"
Okay, maybe you have to be a food dork like me to get really excited about a box of vegetables with the dirt still clinging to them - but I do get really excited about it. And after the rummaging comes the cooking and the eating, which is just as good. Last night, for instance, the beets, watercress and onions from the veg box got turned into French onion soup which was served with a thyme-roasted beet, watercress, walnut and blue cheese salad tossed in a walnut oil and apple balsamic vinaigrette (the first batch of which I gracefully dropped all over the floor…). I was so hyped up about the freshness of the vegetables that I was running around waving bits of raw chopped beet under Jeremy’s nose saying, "Smell that! That smells amazing! It smells like the earth! That just came out of the ground today!" It’s the next best thing to growing your own food, I guess. Seeing as I can’t even keep a basil plant alive for more than about two days, there’s very little chance I would even be capable of growing my own food, assuming I had someplace to grow it to begin with - so I think I will be enjoying the thrills of the veg box for a long time to come. What a nice thing to have come to your door every week…and be able to smell the earth in the veg box is an added treat! You actually did grow your own veggies in Terre Haute…and then we had our wonderful garden in Ballersbach. Having said that…having someone else do all the growing and you do all the enjoying sounds like the perfect arrangement! At first I thought you were talking about the television…. You’ve just made me very hungry…time to eat!